Zombie Swords for sale are available in a variety of colors and styles. These popular swords feature a Zombie Apocalypse motif with the famous toxic green color, bio hazard tsuba and splatter designs. Buy all kinds of Zombie Apocalypse themed swords, machetes and more all on sale now. Zombie Hunter Samurai Swords for sale are 40 ¾ inches in all with a 7mm thick blade. These hand forged katana swords have a Zombie motif including a black biohazard tsuba and an undead skull design on the scabbard. They have a sharp 29 ¾ inch 1045 carbon steel blade that is engraved with an undead zombie skull pattern, a zombie hunter logo and the biohazard symbol. These swords have a black nylon cord wrap over imitation ray skin and a biohazard symbol handle ornament. They have a high gloss black lacquer wooden scabbard that features a white undead skull design with green splatter. They include a free cotton storage bag. 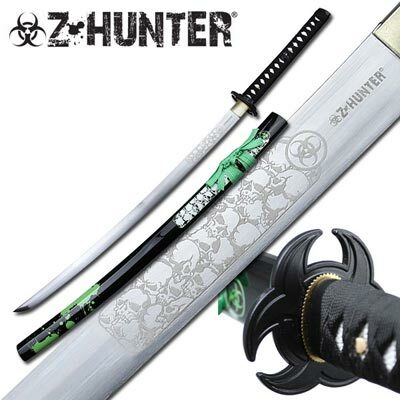 Buy the popular Black Handle Zombie Hunter Samurai Swords for $79.99.